If you want to really bring out the flavour of the oats, you can toast them in the oven for ten minutes the night before, but that’s extra work and definitely not necessary! The trick to quick, creamy oats I’ve found is to soak the oats in a little boiling water for 10 minutes or so before you actually cook them. I measure them out, put them in the saucepan, cover them with boiling water and then head off to walk the dog. When I come back, the oats have sucked up all that liquid, softened and are ready to heat up. Pour in the milk and water and warm up the oats on a medium heat, stirring them frequently with the handle of your wooden spoon. 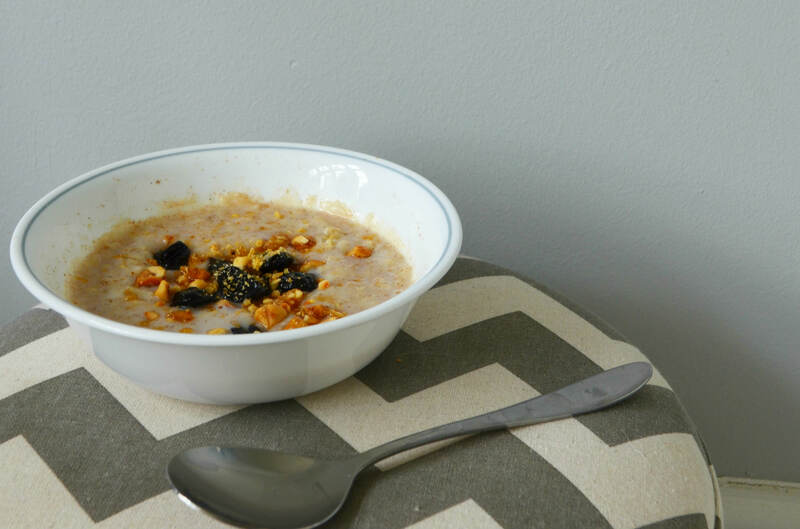 Yep, you heard right – the handle is better than the actual spoon for creaming those oats. Once the oats begin to boil, turn down the heat and add your salt. Even if you’re going to be sweetening your porridge later adding a little salt will help bring out all those flavours. Keep stirring as it thickens up, and throw in any spices, spread or syrups you fancy at this point. Leave to sit for a couple of minutes before serving (it’ll save your tongue from scalding!). Basic right? But it’s amazing how just switching up your choice of milk can really change the flavour of your morning oats. 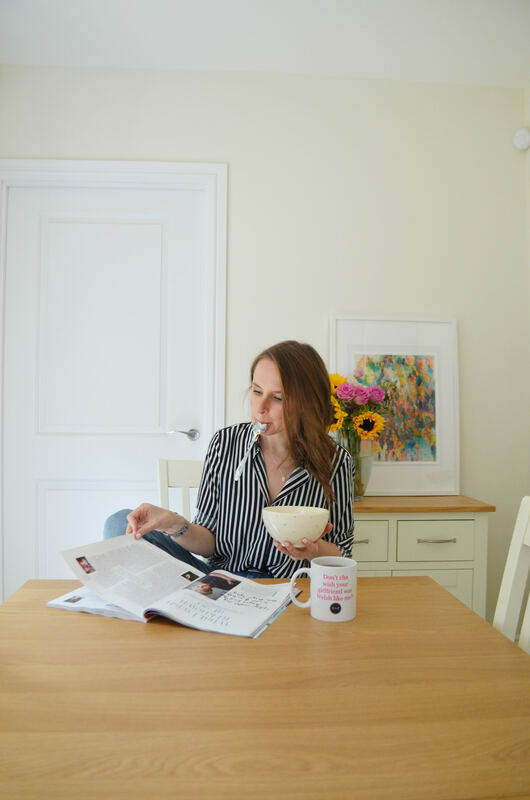 Obviously there are loads of nut milks to choose from – almond and hazelnut are my favourites – but have you ever thought of using strawberry or banana milk? Is your mind blown right now? Most supermarkets out there have got a whole shelf full of flavoured milks to choose from (I think I even saw a Rhubarb and Custard flavoured one in Tesco a few weeks ago…) and they’re great for adding a subtle base flavour before you go crazy with your toppings. In the picture above I used strawberry milk (which turned my porridge pink!) and then topped it with the last of my summer strawbs, dark chocolate and pistachios. Fancy! 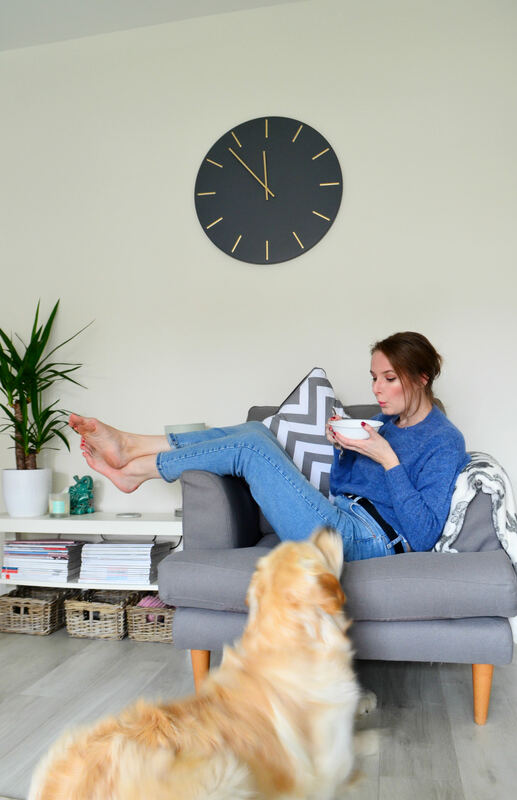 Come on, we’re all guilty of stirring a hefty spoonful of nutella into our porridge on mornings when honey just won’t do. But there are plenty of other ways to flavour your oats while they’re thickening up on the hob, from spices to syrups. Cinnamon is my go to, especially with purée’d apples. Cardamom adds a nice twist if you’re using almond milk, or adding berries. 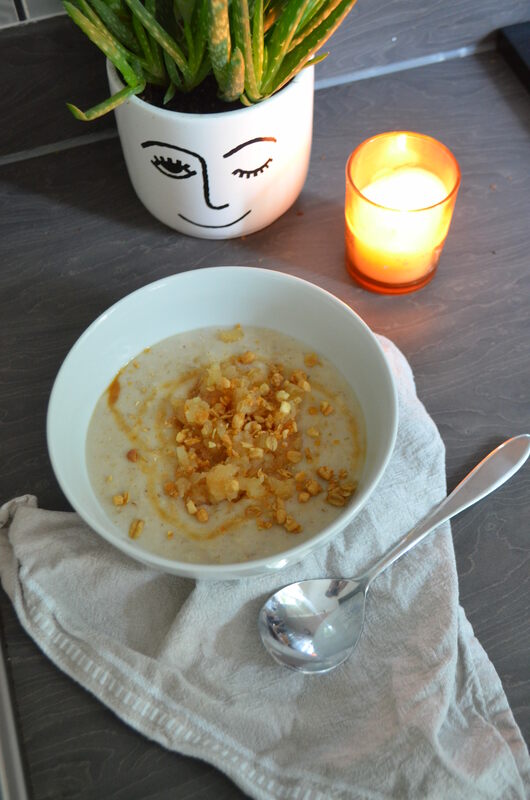 Ginger works well with pears and most dried fruits and nuts, and hey, add some boiled, shredded carrot and you’ve got carrot cake porridge! Turmeric is a very strange one, but it’ll give you a very sunny looking bowl of oats that you can sweeten nicely with lots of honey and some chopped almonds. Nutmeg can mixed with cinnamon, ginger, cardamom and cloves to make a Chai-flavoured porridge. Yum! Maple Syrup is amazing stuff – and even more amazing when you pair it with bacon, baby. It also goes well with coffee, pumpkin and sweet potato. Coconut Syrup can be stirred in with pineapples and a bit of lime to make a pina colada flavoured porridge. Toffee Sauce I like to add when I use apples and cinnamon to make toffee apple flavoured porridge, but hit up your ice cream aisle for similar sauces. Honey is a easy one and works well with nutty and berry-flavoured toppings. It also works well with citrus fruits. Earl Grey Syrup – why not? It’s lovely as a base for citrus-flavoured porridge bowls. Make it by heating up 100ml of water with 100g of caster sugar and a few Earl Grey Teabags. Golden Syrup is a classic, ’nuff said. Biscoff is AMAZING stirred into porridge. Peanut Butter with some jam or with sliced bananas is a classic. Fruit Curds like Passionfruit or Raspberry are a great way to inject some fresh flavouring. Nutella. Need I say more? Marshmallow Fluff. 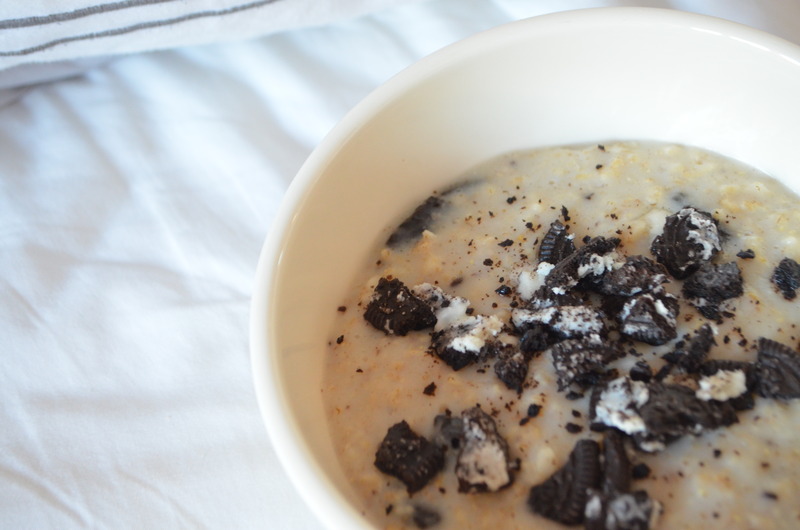 Now that’s just filthy, especially if you add chocolate and some crushed biscuits – Smores Porridge! You can also add a blob of your favourite yoghurt – flavoured or plain. It’ll make your porridge even creamier. But sometimes basic is brilliant; my Mum for example loves her porridge topped off with some demerara sugar and nothing else. 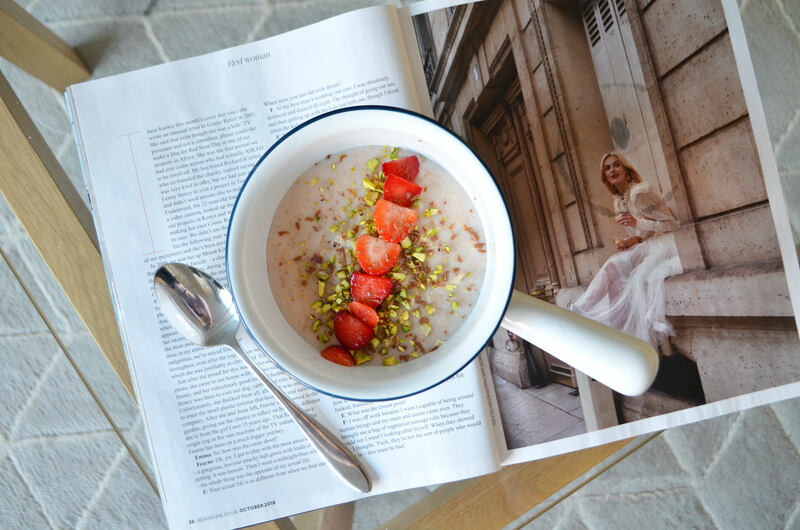 Who says porridge has to be sweet? In fact, most Scots would say that porridge should be made with water, salt and nothing else. But there are plenty of more exciting ways to play around with your porridge if you don’t have a sweet tooth. I saw a recipe online for a Japanese-flavour inspired porridge, with miso paste, mirin, seaweed and sesame seeds that looked really good, or you could try a Huevos Rancheros bowl of oats by flavouring it with paprika, roasted red peppers, avocado, salsa and sour cream. Or what about throwing in some bacon and topping it off with an egg? That’ll certainly see you through to lunchtime! Hmm – could be to do with the oats, unless you’re more active than usual in the morning? Glad you liked the post, let me know if the recipe makes a difference!